U.S. aircraft blasted a residential neighborhood in Fallujah on Saturday, killing at least 16 people and leveling houses there, police and residents said. A U.S. official said the target was a known hideout of Abu Musab al-Zarqawi's terror network. The surprise breakfast-hour strikes were the first significant U.S. military moves in Fallujah since April when Marines backed away from a bloody three-week siege against insurgents holed up there. Since the U.S. forces left, residents have said extremist influence in the Sunni Muslim city, west of Baghdad, has only grown. Brig. Gen. Mark Kimmitt, coalition deputy operations chief, said the United States used "precision weapons" to attack the suspected al-Zarqawi hideout and that the blast caused "multiple secondary explosions" of ammunition and roadside bomb materials stored there, which could have caused some of the casualties and damage. There was no way to confirm the U.S. claim that al-Zarqawi's group used the house. Kimmitt said "significant intelligence" from multiple sources suggested that "a significant number of people in the Zarqawi network were in this house" at the time of the attack. He would not provide further details of the attack and would not say whether it was carried out by aircraft. U.S. officials, speaking on condition of anonymity, said it was unknown whether al-Zarqawi was there. They said al-Zarqawi's death would be a significant blow to the insurgency but would not bring it to an end. The officials did not dispute Iraqi casualty figures. The strike, says CBS News Correspondent Elizabeth Palmer, is bound to add to local resentment again. Elsewhere, U.S. troops battled insurgents for a fourth day near the city of Baqouba, northeast of Baghdad, in fighting that has killed at least six Iraqis and one American soldier, the U.S. military and witnesses said. Three U.S. senators met with interim Prime Minister Iyad Allawi in Baghdad Saturday and later called on the world's nations to do more to help Iraq in the tough times ahead. The visit by Senate Minority Leader Tom Daschle, D-S.D. ; Sen. Joseph Biden, D-Del. ; and Sen. Lindsey Graham, R-S.C., comes amid an upsurge of insurgent attacks as the U.S.-led occupation authority prepares to hand over power to Iraq's interim government June 30. A roadside bomb killed a Portuguese security officer for the state-run Oil Products Co. and his Iraqi guard, police Capt. Diaa Hussein said. The bomb exploded as the two were driving on a road from the southern city of Basra to nearby Zubayr, farther to the south. New York-based Human Rights Watch said in a statement it would be unlawful for the United States to hold detainees, including Saddam Hussein, after the June 30 power transfer without charging them with crimes. The U.S. military has said it will continue to hold thousands of prisoners detained since it invaded Iraq last year and that it could do so legally until a "cessation of hostilities." Al-Zarqawi, a Jordanian-born militant believed to have ties to al Qaeda, has been blamed for the string of car bombings across Iraq, including one Thursday that killed 35 people and wounded 145 at an Iraqi military recruiting center in Baghdad. President Bush has cited al-Zarqawi's presence in Iraq before the April 2003 collapse of Saddam Hussein's regime as evidence of contacts between al Qaeda and the former Iraqi regime. At least two houses were destroyed in Saturday's strike in Fallujah, and six others were damaged in the poor neighborhood. The Iraqi Health Ministry said 16 people were killed, though they expected the number to rise. Residents said 20 bodies — including at least three women and five children — were taken for immediate burial, in accordance with Islamic custom, while hospitals reported at least two more dead. "At 9:30 a.m., a U.S. plane shot two missiles on this residential area," said the Fallujah police chief, Sabbar al-Janabi, as he surveyed the wreckage. "Scores were killed and injured. This picture speaks for itself." In Fallujah, rescue workers combed the scene, searching the rubble for other victims. Slabs of concrete and steel reinforcing bars were upended and twisted, Associated Press Television News footage showed. Water pooled from a 20-foot crater in front of one of the destroyed houses, apparently from where one of the missiles struck. One man displayed several Qurans burned in the strikes. Outraged residents accused the Americans of trying to inflict maximum damaged by firing two strikes — one first to attack and another to kill the rescuers. "The number of casualties is so high because after the first missile we jumped to rescue the victims," said Wissam Ali Hamad. "The second missile killed those trying to carry out the rescue." U.S. Marines besieged Fallujah in April after four American security contractors were killed in an ambush in the city and their bodies mutilated. Ten Marines and hundreds of Iraqis, many of them civilians, died before the siege was lifted and security was handed over to an Iraqi volunteer force, the Fallujah Brigade. The clashes northeast of the capital began Wednesday in Buhriz when insurgents fired on U.S. troops after they met with the mayor to discuss reconstruction projects, 1st Infantry Division spokesman Maj. Neal O'Brien said. Clashes have continued intermittently in the Baqouba area ever since. One American soldier died of wounds suffered Friday in Buhriz, O'Brien said. The clashes spread Saturday to nearby Tahrir, where insurgents fired rocket-propelled grenades at a U.S. patrol, wounding two U.S. soldiers, O'Brien said. The soldiers were evacuated to the 31st Combat Support Hospital. Dr. Nassir Jawad of the Baqouba General Hospital said at least six Iraqis were killed and 54 were wounded in the Buhriz fighting. 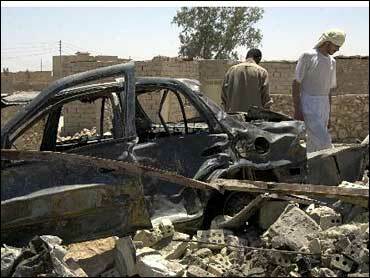 Municipal officials had said 13 Iraqis died. U.S. officials put the Iraqi death toll at 10 in the Thursday fighting and five on Friday. Meanwhile, Iraq was hoping to resume partial exports this weekend. Insurgents cut off all exports from the southern oilfields in bombings this week. Exports from Iraq's other field near Kirkuk were halted last month due to sabotage on the pipeline to the Mediterranean port of Ceyhan, Turkey. Iraq had been exporting about 1.5 million barrels of crude oil a day through two southern pipelines, both of which were damaged. A coalition spokesman said Friday the smaller pipeline had nearly been repaired but full exports would probably not resume before Wednesday. The pipeline attacks are part of a stepped up campaign of violence in the run-up to the June 30 transfer of sovereignty to the interim Iraqi government.